It's no secret that the South of France is home to some of the nation's most beloved beaches. Sun worshippers from all over Europe flock to the region to stroll across the sands, soak up some rays and splash around in the sea. If you're one of the unlucky few that have yet to set foot on a Southern French beach, find out what you're missing with this short guide to some of the region's most beautiful beaches. Hidden between Sainte Maxime and Saint Tropez, Port Grimaud is an enchanting seaside town that was created in the sixties by François Spoerry, a noted architect. The area, crisscrossed with small canals, resembles a mini Venice, and is popular with those who own boats as each property comes with its very own berth. The beach itself is a dazzling stretch of golden sand located just outside the town. With its gently rolling slope and calm, shallow waters, it is ideal for picnics, family outings or, if you're feeling adventurous, a spot of windsurfing or kayaking. If you take a trip up the St Tropez coast, you'll arrive at Toulon and the Rayol Canadel sur mer coastline. This beach is one of South France's hidden treasures and rarely sees much action, even during the high season, which makes it the perfect getaway for people who want to enjoy their holiday in peace. Still, if you're feeling sociable there are a handful of great bars where you can enjoy a drink. Located close to the Palais des Festivals, the beach at Cannes is perfect for those who like a touch of glamour with their sun bathing. This world-famous beach is home to the renowned Cannes film festival and is a big hit with holidaymakers all year round. If you find it too crowded, the coastal village of Theoule sur mer is only a short car trip away. This calm, cosy coastal retreat has plenty of bars and cafes, making it the perfect place to grab a quiet meal or drink at the end of a busy day. 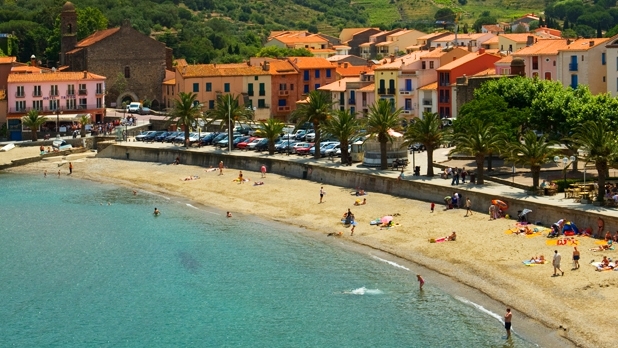 Although the beaches at Collioure are quite small, what they lack in size they more than make up for in sheer beauty. Rest assured, the breathtaking views aren't the only thing this place has to offer; the surrounding town also boasts a selection of eateries, shops, boutiques and artist trails for you to enjoy.